Normal Bang"Stock "Stock Picks" for the "Year 2013"
> · ING Vysya Bank has shown consistent and steady performance over the past few quarters with strong hold on asset quality, operational efficiency and commendable NIMs. > · All these parameters has led to an improvement in the return ratios of the bank. > · We expect the bank’s profitability to grow at 28.8% CAGR over FY12-FY14E. RoE is expected to improve to 15.4% in FY14E from 13.6% in FY12 and RoA is expected to improve to 1.3% in FY14 from 1.0% in FY12. > · At CMP, the stock is trading at 1.7x and 1.5x FY13E and FY14E Adj BVPS and 12.32x and 9.83x FY13E and FY14E EPS respectively. > · FCL’s Electrical Cables business has been giving strong performances and is likely to continue with the same. The Communication Cables business also seems to be bottoming out and with the revival in optic fiber demand expected in the country this business is expected to do well in the future. > · The company has a strong brand image. It has a wide distribution network and backward integration which provides strong competitive advantages to FCL over its peers. > · FCL has formed JVs with J-Power Systems, Japan for manufacturing EHV cables and with Corning, USA for marketing optical fiber in India. These JVs will help the company enter new markets (EHV cables) where demand is high and will help strengthen the product portfolio of the company. > · The company over the years has closed down most of its derivative contracts and expects to get rid of all the loss making contracts by FY13. This will improve the bottom line going forward. 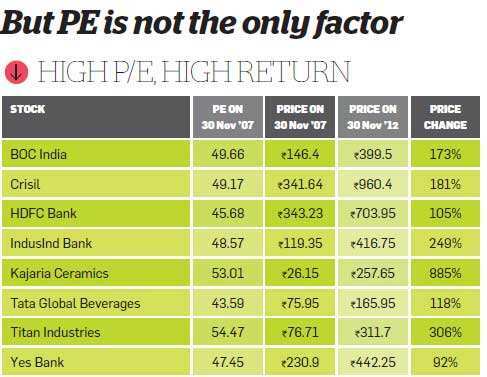 > · At CMP the stock trades at 6.4x & 5.3x its FY13E & FY14E EPS. > · Gateway Distriparks Ltd (GDL) is an integrated logistics player in the container movement space. > · While the company is facing pressure due to global slowdown but revival of international trade and addition of capacities at Faridabad (expected by March 2013) and JNPT should bode well for the company going forward. > · In addition, the three month moving average of Indian non-oil foreign trade data is showing some signs of improvement which should augur well for GDL. > · At CMP, the stock is trading at a P/E of 10.7x and 9.7x its FY13E and FY14E earnings. > · Phillips Carbon Black (PCB) reported loss in Q2FY13 on account of lower realization and lower capacity utilization resulting from excessive dumping of carbon black from China which continued to put pressure on the company’s margins. > · However, on the positive side; Imposition of safeguard duty and Decline in crude prices (leading to decline in prices of carbon black feed stock) have taken place which could bring a significant revival in the company’s business. > · Going forward, we believe that the imposition of safeguard duty will lead to an improvement in the realization rate of carbon black as well the capacity utilization of the company. Moreover, power revenues will also witness an improvement which will lead to an increase in EBITDA margins. > · As the tyre companies have already imported large quantities of carbon black in anticipation of safeguard duty, Q3FY13 results can remain under pressure. The benefit of positive development will be visible in Q4FY13E results only. > · The company’s core business of conductor and optical fibre is likely to show improved performance in the coming period. > · The increase in capacity of optical fibre from 12 mn km to 20 mn km with improving demand from both Indian and international markets will help company to report higher earnings. > · 3 large BOOM transmission line projects are under implementation with first one to commission from April 2013 and other two are on schedule to start in April 2014. > · These 3 annuity projects once commissioned will add substantial value to the company. > · At CMP, the stock is trading at 12.4x and 9.1x its FY13E and FY14E EPS respectively. Additional Coupon Rate - Category - IV Applicants - 0.50% p.a. When Bonds held by the original allottees of Category IV are sold / transferred, coupon rate will be revised to the coupon rate for Category I, II & III investors. Refer to details. Recently the Economic Times presented a nice article about “10 golden rules of investing: How to secure your financial future” . Thanks for your continuing support. I am very happy to share that your beloved blog is re-launched with more focus – investment and technology . There will be regular updates on these topics. Looking forward to your continuing support.